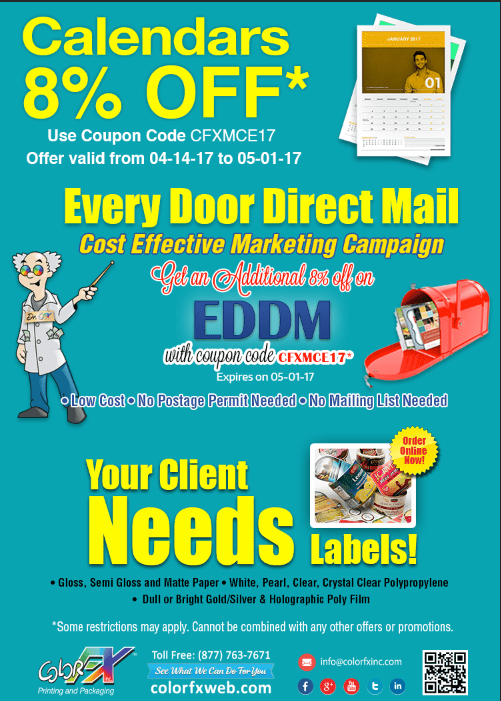 Save 8% off on Calendars & EDDM Postcards from Colorfxweb.com. Coupon Code: CFXMCE17. Expires on 05/01/17. Are you a part of a church or a non-profit organization? One way to bolster awareness of your cause, raise money for your organization, and stay in touch with your donors is to print an annual calendar. Here are three suggestions for calendar printing and calendar design for non-profit organizations. 1. Decide what type of calendar you want to print. There are a number of different ways to print a calendar. For example, you might want to print a one-year calendar on a 6” x 9” or 8.5” x 5.5” postcard. These are convenient because you can print a calendar on one side and print mailing information and your message on the other side. You can print these in large quantities because they are inexpensive to produce, then you can easily mail them to your donor list. On the other hand, you might want to print something larger that members or donors will want to post on their fridge or wall. You could print an annual calendar on an 11” x 17” sheet of paper, like a large poster. Alternatively, you could print a more traditional, 12-month wall calendar. This is by far the nicest type of calendar, but it’s also the most expensive to produce.